We’ve been talking about this around here for some time now, but after earlier in the weekend when Miss B whipped me once again at no-farmers-no-nastiness-Carcassonne, I suggested that we try it with the full rules, although still using a no-nastiness convention (basically meaning that I’m not trying to contest points or playing tiles that would cause scupperage, as I might in adult company). Miss B was well up for this, so I explained the way farmers work and we got on with it. 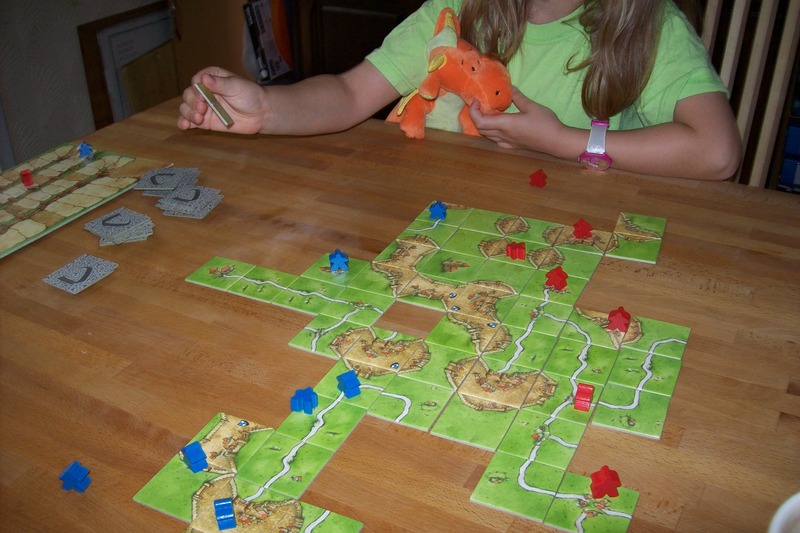 In case you don’t know, farmers are easily the most complicated part of the basic set of Carcassonne. They stay in play once placed (and can’t be recovered like other followers) and only score at the end of the game in a way that can be difficult to predict and requires rather more planning than relying on cloisters, roads and cities for scoring. I tried to advise Miss B on sensible use of farmers, but as usual she made her own choices, which resulted in two farmers being put into play by her, one of which scored nothing. 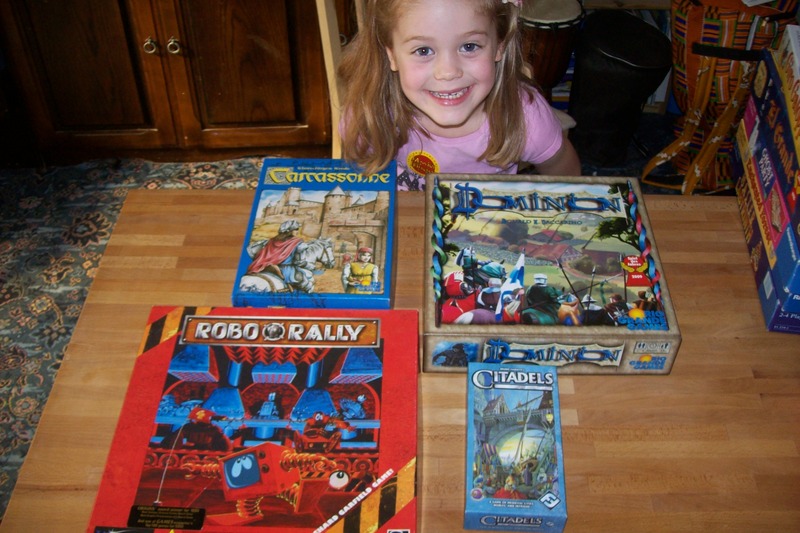 By the end of the game I had lapped Miss B on the scoring track, but she didn’t seem to have a problem with this. I suggested that maybe next time we play, we go back to our old way of playing, but she said that she preferred the game with farmers even though she lost. Wow, I’m so proud of her for that. I think next time I’ll give her the option of which rules to play. Now I come to think of it though, I think she was remembering an earlier conversation where I’d said that there isn’t any point in playing with the River tiles if we have no farmers. She’s rather taken with the idea of the River, so I reckon she’s just working towards being allowed to add in an expansion. Cunning. 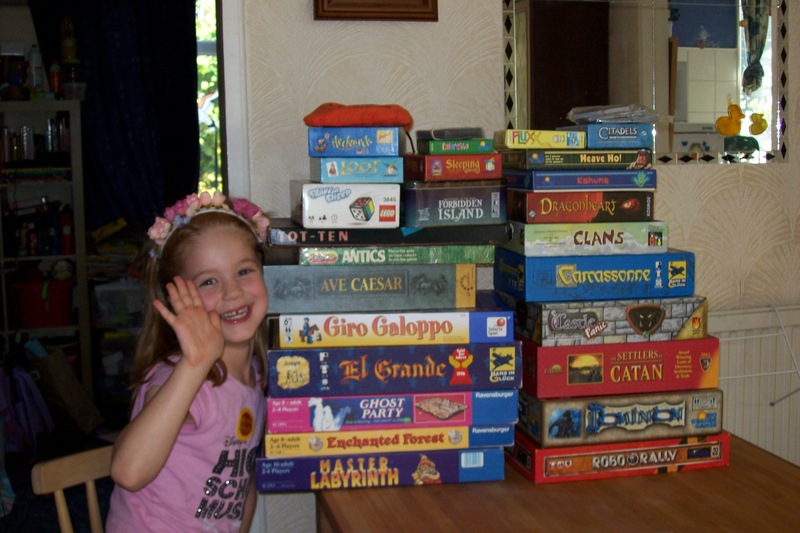 Carcassonne is another one of those Eurogame classics that pretty much everyone likes, though I have only played it a few times. With this game, the rules are so straightforward that it’s difficult to simplify, though possibly the most complicated part of the basic game involves the scoring of farmers, so we just did away with that and only had knights, thieves and monks to play with. 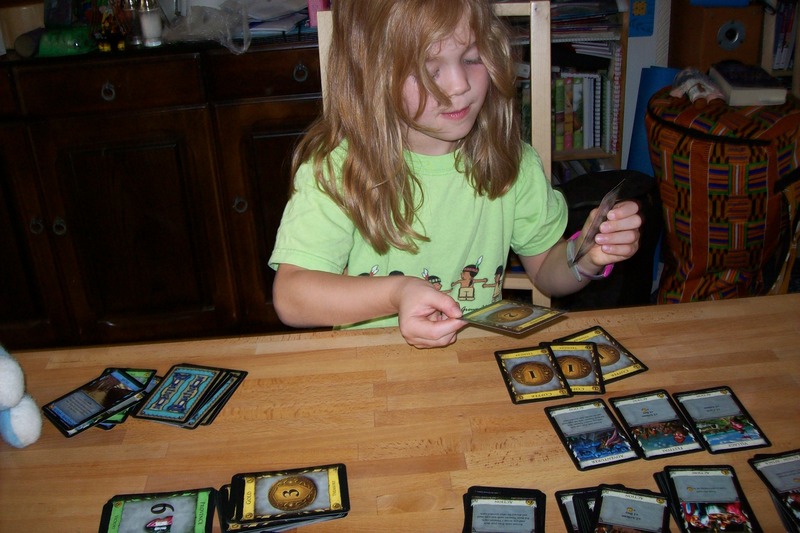 The scoring also went well and soon she was playing a pretty respectable game with little guidance from me. In fact, she went into a strong early lead which she maintained throughout the game until I finally managed to scrape a draw in the final tally. 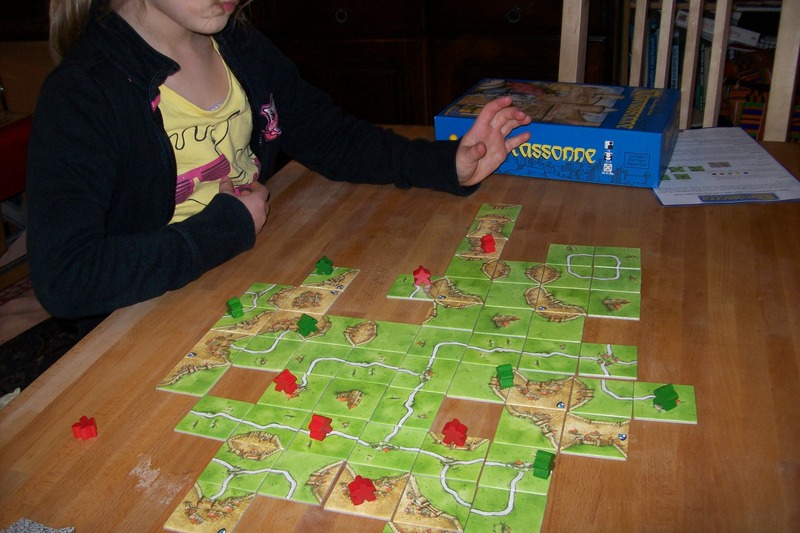 The game: Carcassonne (Rio Grande/Hans Im Glueck), 2 to 5 players aged 8+.